In this article I’m going to analyze some of the top portal casinos and why they rank so high in all the major search engines. They’ve been around for many years and have a proven track record (trust) with Google. Suffice it to say the cyber gambling world is beyond competitive and to compound matters further Google does not take kindly to so-called thin-casino affiliate websites any more. In a post-Penguin world if your site has lost trust with Google it’s virtually impossible to get it back into Google’s good graces again, or is it? Truth be told it could be done, on condition you’re prepared to knuckle down and do things strictly according to the search engine’s quality guidelines. 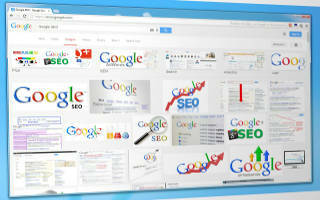 To get your website to rank high in the serps you must concentrate your efforts on these four key areas. Let’s have a look at each one of them and see how the mentioned portals abide by them. It must be created for the visitor. It must be easy to read and have no visible signs of keyword phrases that have only been added to help the pages rank better. If you have a look at the content on the page of Casinolistings you’ll see that it’s well-written, properly structured, engages the user, contains clear defined quality sub-headings, clear calls-to-action and contains no grammatical errors. If you want your site to rank in the top 10 serps you must add something unique. Give your visitors what they want. Be creative and make your content the best you possibly can. As a rule of thumb ask yourself the following question. Would your content look good or would it look out of place if it were published in a glossy magazine? If you hire content writers, proof read your content before you publish it. Ensure that the facts are correct and that there are no spelling/grammatical errors. The pages of Casinolistings ticks all the boxes in the content department. 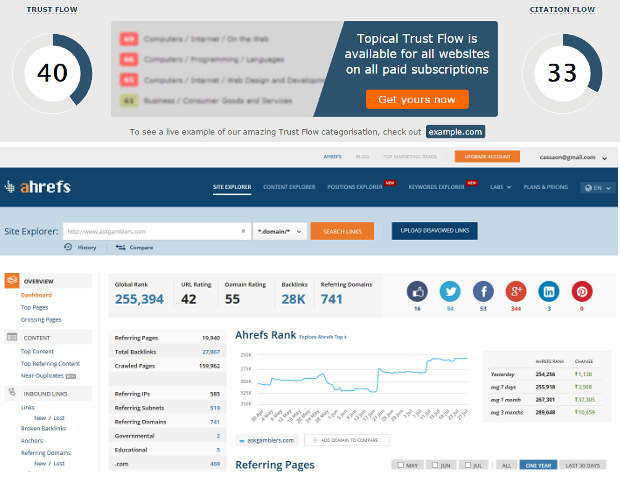 Does your content offer new information and will your visitors find it useful? Are the casino or game reviews you’ve written overly hyped up? Did you cover both sides of the argument? In other words did you include the positive and negative aspects as well? Is there information in the review that is not available at the casino’s website? Does the review offer a different perspective on things and does it help the player to make an informed decision prior to signing up? Have a look at the content on this page. Through a quality lens it must contain concise sub-headings which gives an insight into each pages content. The keyword density occurs naturally (less than 2.5%). 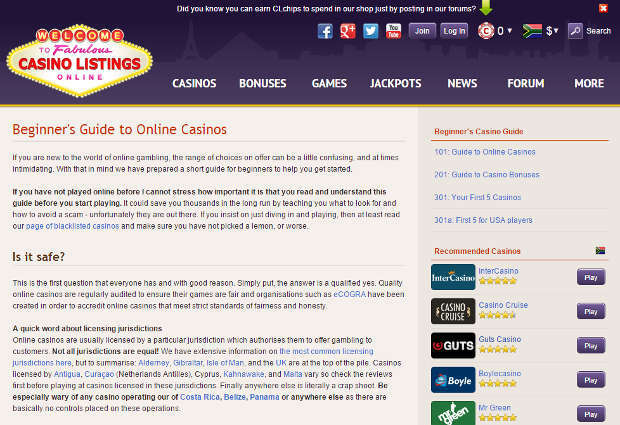 One can clearly see that an expert in the field has written this article hence the reason it’s on page 1 top for these keywords: ”beginner’s guide to online gambling”. How does Google decide to rank webpages for these terms if visitors are not looking for the actual phrase on the content? The answer lies in the words on the page. The article you’ve written does it sound as if it was written by an expert? The reason why I’ve asked this question, if an article is written by an expert a certain ”niche vocabulary” or phraseology is used. The words and phrases it uses clearly defines the topic of the article. If the article you’ve written does not contain any niche vocabulary chances are pretty slim that it won’t rank in Google for the longer term. Make sure that every article you write has its own niche vocabulary. 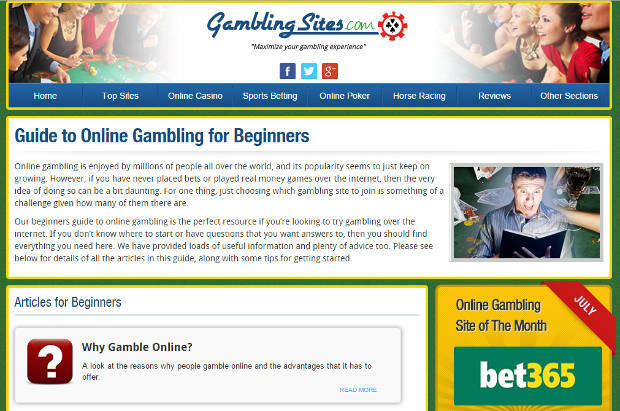 You’ll also note that the top pages for the term beginners guide to gambling online ranks for a myriad of other keyword phrases. The targeted keywords are sprinkled well throughout the content. Each article that’s written by an expert has a slightly different set of theme words which clearly defines the topic. The keyword phrases you’re targeting must relate to your niche. Don’t use theme words or phrases that are not necessary. Don’t repeat a phrase three or four times in the content just so that you can rank well for that term. Google’s Penguin will be on to you like white on rice and you’ll be dropped for keyword stuffing. Google detests poor or spammy content. In the recent round of Panda and Penguin (Panguin) updates most webmasters came to the conclusion that Google does not like affiliate sites. Before I continue I’d just like to mention Exact Match Domains (EMD). An exact match domain is a site that uses the main keyword phrases it’s targeting as its domain name: Latestcasinobonuses.com is a good example. Normally EMD portal casinos target very few keywords since it places all the keywords it targets firmly in the ”EMD phrase” basket. EMD websites don’t carry the same weight as they used to. 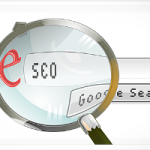 In fact, on the 28th of September 2012, Google released an update that reduced the ranking visibility of poor quality EMD’s. The manner in which your site is structured is not only important to your visitors but to the search engines too. Good organization coupled with a clear intuitive navigation system is vital. From a visitor’s point of view it makes sense that the content on a specific topic should be found in the same section of the site. Once again I’d like to circle back to Casinolistings. Let’s have a look at the page containing ”Top Rated Online Casinos’‘. All the casinos under the same heading are further augmented by another sub-heading titled ”Top User-Voted Casinos”. The sidebar also contains additional links to a myriad of online casinos. 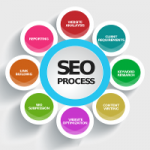 In short, the page clearly provides the information as well as the keyword phrase it wishes to rank for. One of the most overlooked pieces of the SEO puzzle is internal linking. Not only does it help the search engines spider your pages but helps visitors find other related content within your site. WordPress has some nice plugins that can help automate some of the internal linking of your site. Another form of linking is linking pages together within the body of your content. What is an authority website? The Free Dictionary describes authority as ‘the power to enforce’, ‘exact obedience’ or ‘an excepted source of information or advice’. If you want your website to be deemed an authority by the search engines it must lean towards the latter. You can start by creating a well-optimized site with great content (the first pillar of good SEO). 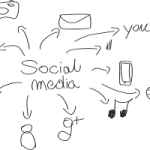 As a stand-alone entity great content is not going to get you anywhere because no one would have heard about you or your site. If you want your site to become an authority it must be well-known within your niche. How do I get my website known? You must put your site name and face out there on as relevant and many high quality places with links pointing back to relevant pages of your site. This all boils down to getting backlinks to your site. Just remember if your site is relatively new and you acquire too many backlinks within a short period of time it can get you penalized. Add fresh content to your website regularly. If people arrive on your site and they note that your content is outdated, it may be enough for them to click the back button. 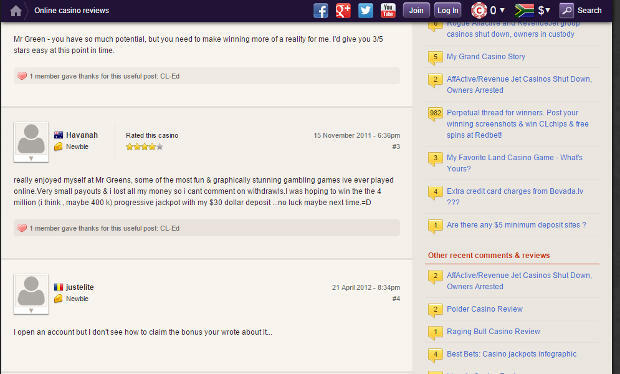 Keep your casino/game reviews and news sections up to date. If you update a review, change the date of the post in WordPress which indicates the new date. Askgamblers and Casinolistings are authority websites because they have relatively high Trust Flows (TF) and Citation Flows (CF). Each site has its own unique selling point (USP). In the case of AskGamblers it has a one-of-kind complaints system whilst Casinolistings offers a jackpot graph and quality online casinos reviewed by an expert. When you’re writing content about your website don’t be afraid to link to other authority websites if they have relevant information. Don’t use ‘no follow’ links since it tells the search engines that you don’t trust the site and that you want to hoard PageRank. If you linked to an authority site make sure that the link opens up a new window so that you don’t send your visitors away from your site. You can also have a reference section at the end of your content with active hyperlinks pointing to other authority websites. Link out to authority sites only if it makes sense and if it will help your visitor. 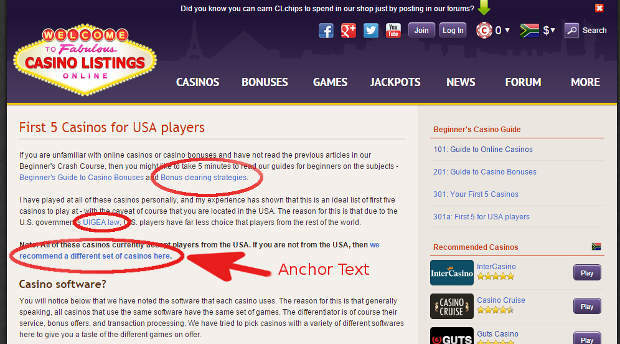 The article ”First 5 Casinos for USA players” features anchor texts that gives a clear description to the inner pages they’re pointing to. What is a safe level for keyword-rich type of anchor text? I don’t believe there is a safe level I think it’s a moving target. Casinolistings can get away with numerous keyword rich anchor texts because it’s an authority site-it already established trust with Google. If you’re just starting out I’d recommend you don’t use any more keyword rich anchor text. Save it for internal page linking and link from other sites using the page title or URL of the page you’re linking to. When a visitor arrives on your site you have a very short period of time to make an impression. The first impression decides whether you’ll have a depositing player or a fleeing one. Apart from the design, your website must load fast. You don’t want your visitors waiting for ages before a page opens up. If you have a look at these authority sites, would you say that they are sticky? I think so. How does one define sticky? Bounce rate and the average time a visitor spends on your site is regarded as ”Sticky”. If your site’s maximum bounce rate over the last month hovered around 40% and the average half is less than that. It means that 20% of the visitors visiting your site went straight back to Google after reaching the landing page. How can you improve your site’s dwell time? Look at the pages with the lowest ”visit duration” and the highest ”bounce rate”; see if there’s anything you can do about them to keep your visitors to stay longer. Any page with a high bounce rate is a clear indication to Google that your site is not giving your visitors what they want. If you want to your visitors to stick around you can start by adding a captivating headline to your articles that makes them want to read more. Eight out of ten times if your visitor reads the headline and finds it interesting they’ll read the first paragraph. The first paragraph is almost as important as the headline itself. This is why your opening paragraph must be a summary of what your visitor will find further down the page. What do my visitors want? What do they want to ask me? It’s important that your visitors find what they’re looking for quick and easy. The content on your site must answer real questions and provide accurate answers. Create informative, relevant videos and embed them in your web pages. Make sure that your visitors click to watch, never let your videos start automatically. Make sure the content lives up to the title. The top portals are interactive sites. Why? At the bottom of each page they have a comments section. Comments helps you to start a dialogue with your target audience. When players see that you’re answering their questions personally it indicates professionalism and that you have their best interest at heart. The portal casinos mentioned throughout this article didn’t get their current rankings on Google purely by chance or by some magical wand wielded by a toothless fairy. They got there through hard, consistent and smart work. A layer of data shows that Google favors EAT sites. This abbreviation stands for expertise, authority and trustworthiness. AskGamblers and Casinolistings help their visitors make the right decisions by providing them with honest and useful information. A site’s rating is a collective process that contains a certain element of trust and spells out correctly what its users can expect from it. We know that Google is changing all the time and becoming progressively more nuanced. The easiest way to become a winner is to copy other winners. ← Previous StoryRugby Championship Ellis Park: Can The Springboks Trump The Mighty All Blacks? Casino Affiliates:What Is Off-Page SEO?